Michelle Obama’s glittery Balenciaga boots that shook the internet, say “FREEDOM” above all. Balenciaga Spring/Summer 2019, left. Michelle Obama on her “Becoming” book tour interview with Sarah Jessica Parker, 20 Dec 2019, right. 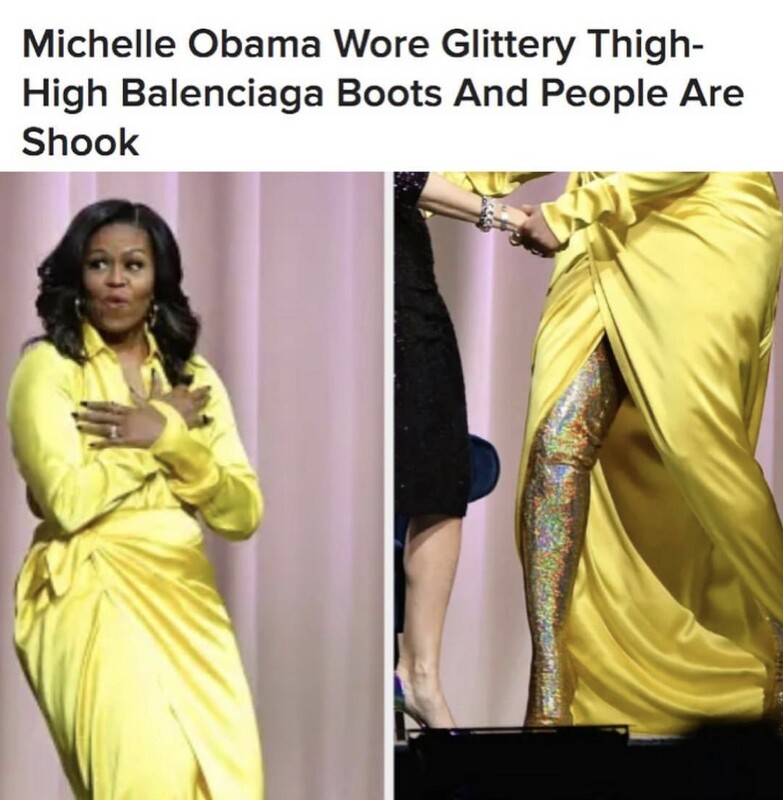 As the world turns over today with half empty offices and workers already out the door for the Holidays, the Internet was raging with news from Washington… but also Chicago when images of Michelle Obama in a head-to-glittered-shank-toe Balenciaga SS19 look hit the social channels. For anyone who doesn’t follow fashion (and, really, it’s fine if you don’t) a few words here on why Michelle’s outfit — put together by her post-White House stylist, Meredith Koop @meredithkoop — has particular significance. Like all FLOTUSes, what and who Michelle Obama wore while in the White House was often as carefully scrutinized (and symbolically resonant) as her husband’s policy. For her part, she wore exclusively American designers for nearly every public appearance, and moreover, nearly exclusively American designers from distinctly immigrant backgrounds: Jason Wu, Narciso Rodriguez, Thakoon, Isabel Toledo, many others. She would break this rule only when visiting foreign Heads of State, when she would wear, wherever possible, designers from the hosting nation. 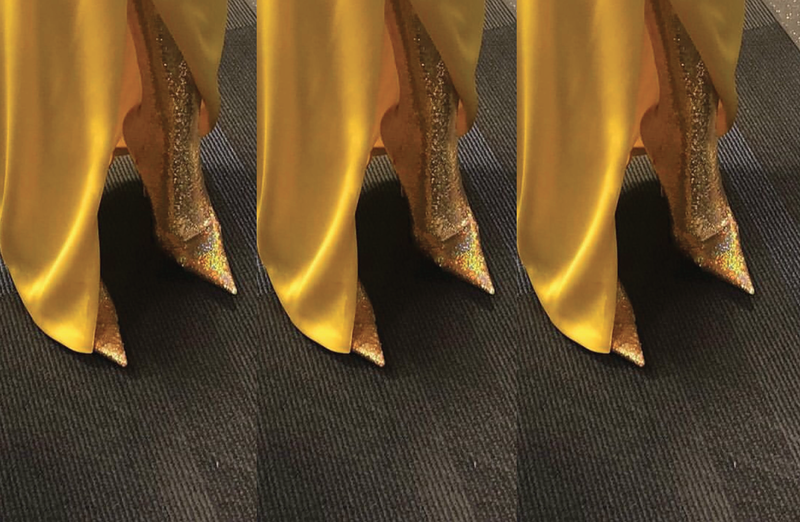 Read: Michelle was fully aware of whose glitter shank-toed shoes she was wearing, where the designer and stylist came from, who they represent and why she chose to represent them. She was wearing Balenciaga, hardly a fledgling brand, and one helmed by a creative director and a stylist (Demna Gvasalia and Lotta Volkova) who are hardly unknown. The wedge here could be, if one wants to read deeper (and really, why not? ), Gvasalia and Volkova’s own biographies and particular deployment of style. Volkova was born in Vladivostok, a city at Russia’s farthest eastern edge, near to where it borders China and North Korea. Gvasalia is Georgian. Georgia, to quickly situate it, became part of the Eastern Bloc during Soviet times and located on the Eastern edge of the Black Sea, with Russia to its north, Turkey and Armenia to its south, and Azerbaijan to its East. When the USSR collapsed in 1989, the entire region exploded in unrest and warfare. In the 1990s, it endured the most brutal and horrifying civil war. Both Gvasalia and Volkova grew up amid Soviet collapse and its aftermath, a place and time where remixing the Western imports to their regions (fashion, music, social liberalism) was commonplace. Often, critics of Balenciaga and Vetements claim the creative direction hinges too much on “appropriation,” which is nearly always a pejorative designation in fashion and design. But to that I ask, appropriating what, exactly? Elements of ’90s Western culture? To be sure, mainstream ’90s pop culture dominated youth culture in Georgia and Russia just as it did in the West. At least anecdotally, I can attest to the fact that three of my close Georgian friends were listening to Tupac and gangsta rap in Tbilisi at exactly the same time I was while growing up in the midst of it in Echo Park, L.A. To me what Gvasalia and Volkova are doing is less appropriation than referencing their childhoods. And we see this clearly in Gvasalia’s SS19 collection for Vetements, which made explicit references to life in the 90s during the Georgian civil war. Perhaps there is a message in that yellow wrap and those iridescent boots on international policy in the time of Trump. Or perhaps it was as simple as reminding that America, at its best, is a place for those who seemed to have been damned by virtue of their birthplace to really shine brightly.